March 2016 – Alice Caroline was a client we took over as Webbees in March 2016. The team never took much interest in the website health and search results. The client wanted to change this by organising a monthly meeting where we would discuss overall strategy and ways to improve the website and traffic. The website is very extensive with over 1600 products and many with 12 variations. The business has boomed over the last three years. However, the client came to realise that customers not always had a good experience. The site was very slow to load with a high exit rate at every stage of the checkout. This project would not be an overnight fix. With Yoast SEO installed the staff are very much aware of how to write optimised text. I would mainly work on making the site technically better. We moved to PHP7 just recently, which had a great benefit on the website in terms of performance improvements. This is realised by drastically reducing memory consumption with optimised images. We reduced the checkout steps and created online payment to give costumers a better e-shopping experience. We worked on making better use of analytics reports to understand customers behaviour, improved stock control and identifying popular products though low in sales for price strategy. 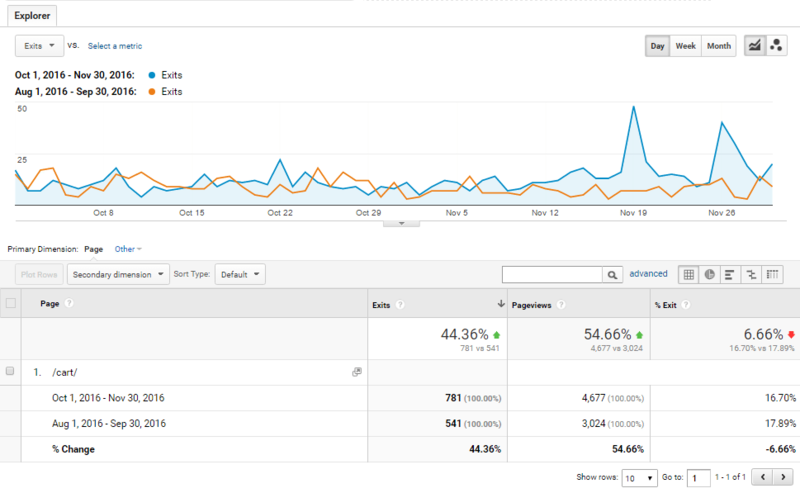 We also analysed incoming traffic and making better use of social media as well as placing adverts on popular blogs. Webbees are continuously working with Alice Caroline and consulting on making small improvements. We are working on a new design of website that will improve navigation, site speed and client engagement. Furthermore, we are constantly looking to make small changes and improvements. The example above shows that although the exits have increased, we have an exit reduction of 6.66% over a two month period. We are now working on a clearer postage strategy to reduce this even more. It’s the A-B testing over a longer period that makes you understand the behaviour and how to improve it.